Jacopo Robusti (pseudonym Tintoretto, which means “little dyer”) was born and raised in Venice. He got his nickname because of his father, the dyer of silk. The love for drawing in little Jacopo manifested itself since childhood. As a child, he painted the walls with coal and paint of his father. As a young man, Tintoretto studied under the great Titian. Unfortunately, we do not know the reasons for his departure from the artist’s studio. Later, he worked tirelessly, while learning from his predecessors. Diligent work led him to fame – he became the famous painter of Venice. Many churches adorn his large canvas. He perfectly managed to master the art of drawing, knew how to elegantly show figures in difficult angles, in motion. 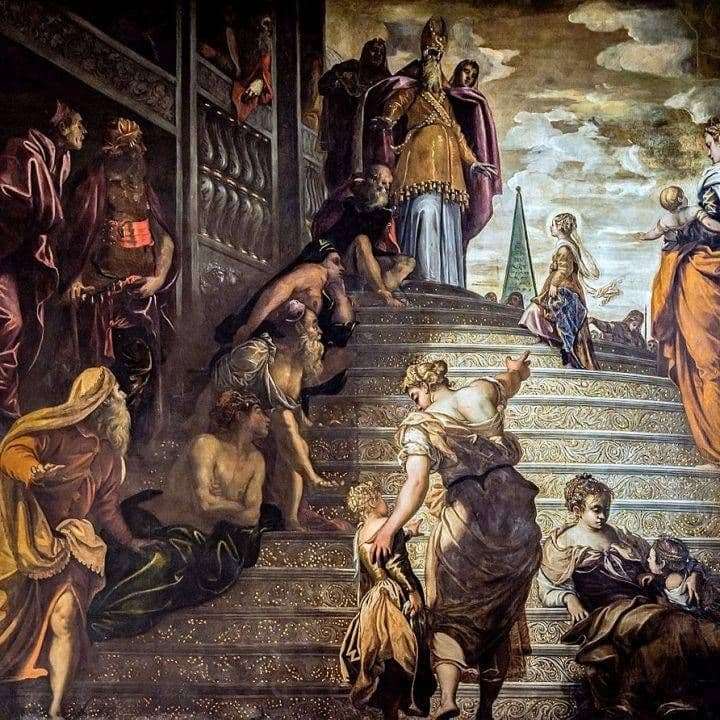 In Venice, in the church of the Madonna dell Orto, the famous Tintoretto’s painting “The Introduction of Mary into the Temple” (1555) is kept. The artist began work on the canvas in the middle of the 1550s. He wanted to do something new, not like other pictures. Therefore, his canvas is different from Titian’s Entry into the Temple. The size of the canvas 429h480 cm, painted with oil painting on canvas. Looking into the picture, we will see a steep staircase that leads us to the temple. The figures of beggars, mothers with children are scattered on it, a priest is drawn at the very top of the stairs. Last up the stairs is Mary. The picture shows us how huge the world is, how fast the dynamics of space are. The whole composition has a special significance, excitement.